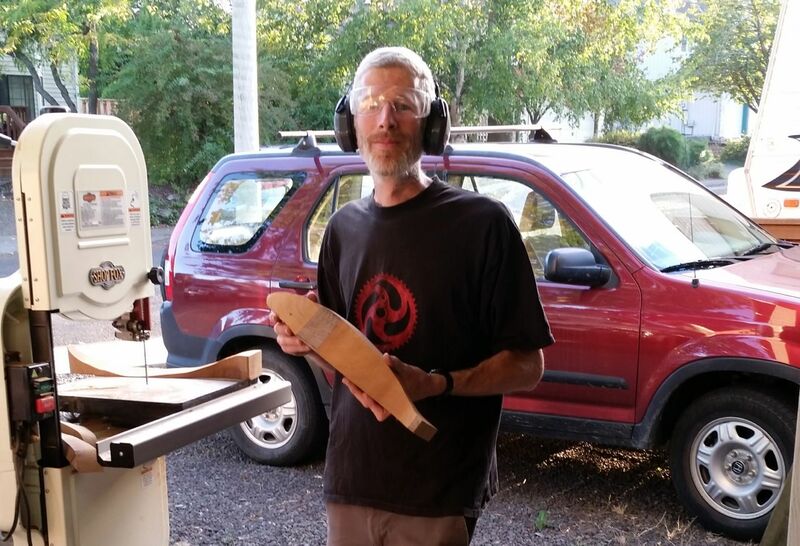 It all started when I acquired a huge piece of a Douglas fir beam at a construction site. Covered in mud and heavy enough that I could only carry it a modest distance, I knew that I had to have it. What I would do with it was another question altogether. A piece of wood this large should have some defined and important purpose, so I didn’t rush into anything with it. After the wood sat in my basement for some months, it spoke to me and said that it was a whale. The surface of the block had some defined ridges where the grain rose ever so slightly, reminding me of a current in water. I contemplated this, eventually deciding to use it to carve a “block” to make a block print of a whale, capitalizing on the wood’s grain. A few dozen prints were made and the block was relegated to the narrow space between the floor and bottom shelf of my workbench, but I knew that it still had more life left in it. Two years later, the block told me that it wanted to be a real whale. Well, a three dimensional whale anyway; thus the second phase of the project began. Since the whale block print was based on a gray whale, I knew the sculpture should be the same. The idea was that the whale would go on a migration of sorts, much like the real animal does each year. I started carving a prototype from another piece of fir, but found the wood to be too unyielding, so I stopped carving, but the idea wouldn’t die. Then, luckily, I found a piece of forgotten western red cedar in my scrap bin and the project came alive again. And it seems that the more people I tell about the project, the more the interest builds. Keep your eye this blog for more details and how to get involved. Sounds like a whale of a tale in the making. I hope it doesn’t turn out to be just a fluke. It sounds like a fun project as long as you resist the temptation to spout off. DoryMan Sailing, rowing, and good cheer from the PNW. Hakai Magazine Wonder, science, and culture of the sea. Mission Azul Drawings and stories about plants, people, and other cool stuff. The Outer Shores Fascinating, beautiful sea creatures.